The Shinbundang Line (aka Sinbundang Line; Hangul: 신분당선; Hanja: 新盆唐線; literally, New Bundang Line) or DX Line for Dynamic Express Line is a 31 km (19 mi) long line of the Seoul Metropolitan Subway. It is the world's fifth subway to run completely driverless and the second completely driverless metro line to open in South Korea, after Busan Subway Line 4. It connects Gangnam Station and Gwanggyo Station in 37 minutes, a feat achieved by being the first line to operate South Korea's next-generation subway car travelling at over 90 km/h (56 mph), with the fastest average speed of any subway in the country. The initial route opened in October 2011 passed through 6 stations intersecting with three existing lines at Gangnam Station (Line 2), Yangjae Station (Line 3), and Jeongja Station (Bundang Line). Phase 2 opened on 30 January 2016 added 6 stations to the south, extending the line to serve Yongin's Suji-gu and Suwon's Gwanggyo New City. Construction for Phase 3's extension northwards to Sinsa Station is planned in 2016, with opening slated for 2022. Construction started in mid-2005, for revenue start in Sep 2011. However, because of the flooding of late July 2011, the opening was delayed and eventually opened on 28 October 2011. There was a debate between Seongnam City and Suwon City regarding whether Migeum should be included in the Phase 2 extension of Shinbundang Line. Supporters argued that the distance between Jeongja Station and SB01, an originally planned station to follow Jeongja, would be unusually long at 3.76 km (2.34 mi). They also argued that the inclusion of Migeum will alleviate traffic in the area. Meanwhile, the Suwon opposition claims that the inclusion would delay travel time to Gwanggyo, a planned area of Suwon in construction. Gwanggyo Jungang (Ajou Univ.) Station opened its underground bus transfer station in early March 2016, where screen doors are installed on bus platforms so bus riders from all over Suwon can transfer to the subway directly. The price to ride the Shinbundang Line is higher than standard fare for the rest of the Seoul subway system. The minimum cost is currently 2,150 won to ride (base subway fare of 1,250 won along with a 900 won surcharge for using the line). If one crosses Jeongja Station, 200 won is charged on top of the 900 won extra charge. Transfer gate to Seoul Subway Line 2 at Gangnam Station. The front of the subway car is open for viewing thanks to driverless operation. The interior of the 2011 introduced subway car built by Hyundai Rotem. Phase 1 alleviated some of the traffic from inner Seoul to Bundang which is mainly residential and within the Seoul Capital Area. Phase 1 was 17.3 km (10.7 mi) and intersects with several subway lines in south-eastern Seoul as well as with the Bundang Line. Travel from one end to the other was 16 minutes. Construction lasted for roughly six years starting in mid-2005 and ended at the end of October 2011. Total cost between public and private sectors was estimated at 1.169 trillion won. Phase 2 was primarily designed to ease heavy traffic between Yongin's Suji-gu and Bundang/Seoul, as Suji-gu was not a planned city like Bundang but abruptly and organically developed with large apartment complexes. As a result, Suji-gu is even more residential than Bundang, resulting in heavy traffic in connecting roads. The other aim was to connect the newly planned city of Gwanggyo rapidly to Seoul. Because of the investors and owners of Phase 1 and 2 being different, a 300 won extra charge was added on top of the 900 won extra charge if riders crossed Jeongja Station. Residents of Suji and Gwanggyo criticized the fare discrimination, despite a cashback being offered to frequent riders between Pangyo Station and Dongcheon/Suji-gu Office Station (200 won for Dongcheon and 100 won for Suji-gu Office). The mayor of Yongin and Suwon, along with officials from Gyeonggi-do asked the Ministry of Land, Infrastructure and Transport to lower the fares, which announced that it is trying to cut the fare by using low interest rate loans but it would take at least a year for it to be finalized. Phase 3's route is not yet confirmed but the northern extension will extend the line north-west of Gangnam where it will cross several additional lines before potentially ending at Yongsan Station. This additional stretch is estimated to cost at least 400 billion won. An additional consideration would be to push the line north beyond Yongsan Station and end around Gwanghwamun Station and Gyeongbokgung Station, making it easier for commuters to access Gangnam from the central business district of Seoul. It was unclear if this idea has been scrapped or pushed back for a later reevaluation but resurfaced as a March 2012 campaign promise by Hong Sa-duk to expand the line near Gyeongbokgung Station] Currently the plan for this phase is an extension from Sinsa to Yongsan, potentially sharing tracks with the GTX A line towards Ilsan. Construction will initially begin in 2016 between Sinsa and Gangnam only, slated for opening in 2022. Phase 4 extension to Suwon's Homaesil and Hwaseo Station is currently undergoing economic viability assessments by the government, with Suwon City saying that results should be positive when it comes out. From Gangnam Station, trains are available from 5:30am until 24:50 midnight on weekdays, cut to 11:48pm on weekends and public holidays. However, the last train to Gwanggyo departs at 24:26 on weekdays, cut to 23:48 on weekends, with the remainder going until Jeongja Station only. The trains are automated and run every 2.5 minutes during peak times to 8 minutes during off-peak hours. The SBL Line signal system is based on state-of-the-art communications-based train control (CBTC) technology, utilizing two-way digital radio communications between intelligent trains, and wayside equipment, and a network of ATS/ATO computers designed for very high system reliability and availability. Platforms can accommodate 10-car trains at 200 meters but initially 6-car trains will be used. Phase 1 was opened on October 28, 2011, and spans from Gangnam to Jeongja. Phase 2 was opened on January 30, 2016, extending the line by 6 stations from Jeongja to Gwanggyo. Migeum Station will open in April 2018, offering a transfer to the Bundang Line. Construction of Phase 3 began in March 2017 between Sinsa and Gangnam, slated for opening in January 2022. Although initially planned to be opened simultaneously with the Sinsa-Gangnam extension, due to the extension from Sinsa to Yongsan potentially sharing tracks with the newly approved GTX A line towards Ilsan, construction will initially begin in 2016 between Sinsa and Gangnam only, slated for opening in 2022. The stations between Sinsa and Yongsan are to be determined when the Yongsan Garrison moves out in 2017 and becomes a public park, with plans to split it at Dongbinggo to Noksapyeong Station, Seoul Station, City Hall Station, Gwanghwamun Station, Gyeongbokgung Station, terminating at Samsong Station in Goyang. However, the Yongsan extension will begin construction earlier than the Samsong extension, as the latter has not been evaluated yet. The southwestern extension to Homaesil is currently undergoing economic feasibility research, with results expected to be positive. It is expected that construction will begin in 2017, with opening potentially in 2022, given that construction usually take 5 years to complete. A further extension to Hwaseong City's Bongdam has been proposed but not evaluated yet. ^ "New Subway Line Shortens Bundang-Gangnam Trip". Chosun Ilbo. 15 July 2011. Retrieved 25 April 2012. ^ 유, 명식. 신분당선 연장선 "빠른데도 소음이 없어요" (in Korean). Hankook Ilbo. ^ a b 강, 은주 (30 January 2016). [경기도] 신분당선 ‘정자~광교’ 연장 전철 개통식 (in Korean). 천지일보. ^ Daugherty, Daniel (August 1, 2011). "Sin Bundang Line Set Back by Floods". 맙소사!. Retrieved 28 September 2011. ^ Daugherty, Daniel (September 4, 2011). "New Sin Bundang Opening Date: Oct. 28". 맙소사!. Retrieved 28 September 2011. ^ Hong, Jang-won (October 27, 2011). 신분당선 연장 `미금역` 신설 (in Korean). MK. Retrieved July 14, 2012. ^ a b 고, 연석 (19 February 2016). 광교중앙(아주대)역 버스 환승 쎈터 방문기 (in Korean). ^ DX Line 홈페이지에 오신것을 환영합니다 (in Korean). DX LINE. Archived from the original on 27 August 2011. Retrieved 11 May 2011. ^ DX Line 홈페이지에 오신것을 환영합니다 (in Korean). DX LINE. Archived from the original on 11 April 2011. Retrieved 11 May 2011. ^ a b "Construction of Sin Bundang Line on Track for 2010 Launch" (DOC) (Press release). IndustryKorea.net. Retrieved 11 May 2011. ^ 경기철도주식회사 - 신분당선. shinbundang2.co.kr. ^ 김, 민욱; 신, 지영 (4 February 2016). 한발늦은 `신분당선 요금인하` 대책. 경인일보 (in Korean). ^ "Construction of Double Track Subway Line Between Gangnam and Yongsan Is Under Consideration". The Dong-A Ilbo. August 22, 2005. ^ Mot, Stephane (29 January 2010). "Yongsan-Gangnam-Bundang subway completed in 2017". Seoul Village. Retrieved 11 May 2011. ^ Lee, Ji-yoon (March 30, 2012). 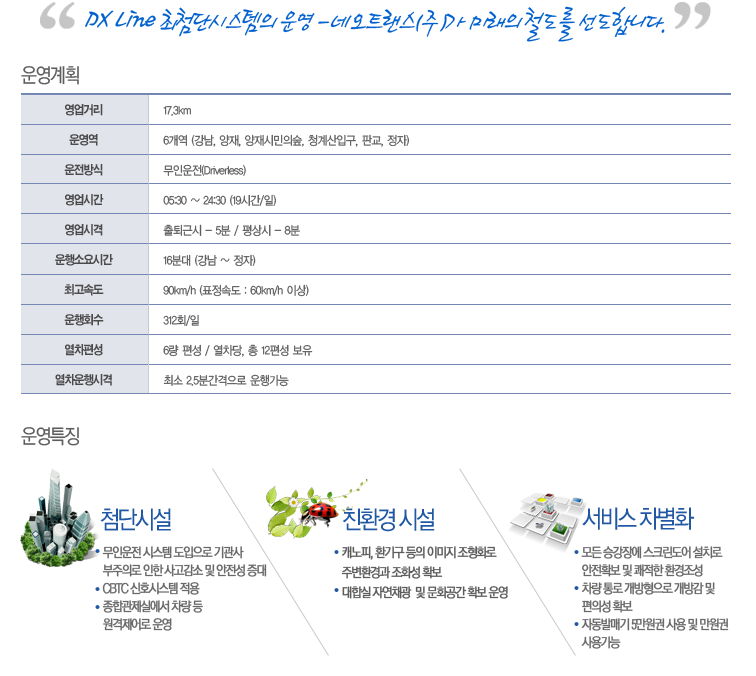 "Candidates Running In Key Districts of Seoul, Busan" (website). Arirang. Retrieved 2012-04-19. ^ Lee, Ji-yoon (March 29, 2012). "Official Campaigning Begins & Candidates" (website). Arirang. Retrieved 2012-04-19. ^ 김, 경호 (28 December 2015). "KDI 신분당선(광교~호매실) 타당성 분석 내년 1월 재개". Newsis (in Korean). ^ DX Line 초첨단시스템의 운영 - 네오트핸싀주마 미래의 철도를 선도합니다 (in Korean). DX LINE. Archived from the original on 27 August 2011. Retrieved 11 May 2011. ^ "THALES awarded CBTC signalling contract for SIN BUNDANG metro line in KOREA" (Press release). Thales. Archived from the original on 29 September 2010. Retrieved 11 May 2011. ^ "미래철도BD". www.frdb.wo.to (in Korean). ^ 한, 상혁 (10 March 2017). "신분당선 강남역~신사역 공사 시작...2022년 1월 개통" (in Korean). Chosun Ilbo. ^ "대중교통 커뮤니티 - SBM (철도, 버스 이용자들의 공간) : 네이버 카페". cafe.naver.com (in Korean). ^ 이, 군호 (11 February 2016). "광교 개통 신분당선, 서울 도심구간 개통시기·확정 노선은?" (in Korean). News1. ^ 김, 종식 (23 February 2016). "정미경 의원, 광교~호매실 복선전철사업 투트랙 전략 - 국제뉴스" (in Korean). Gukje News. ^ 동식, 김 (4 February 2016). "김용남 "신분당선 광교~호매실, 추진 가능성 높아져"". Newsis (in Korean). Wikimedia Commons has media related to Sinbundang Line. This page was last edited on 27 March 2019, at 18:04 (UTC).